One of the most anticipated moments in Star Wars: The Last Jedi was the reunion between Luke Skywalker and Princess Leia Organa. 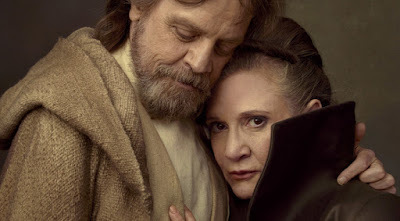 The moment already carried great meaning for fans because the characters hadn't been on screen together since 1983, however it was made even more impactful when Fisher passed away in 2016. Hamill spoke about filming the scene in a recent interview with Entertainment Tonight's Ash Crossan. "I can't watch that scene. It's just, you know, takes me out of the movie completely. I'll get over it, but she'll be forever missed and she's irreplaceable." "I didn't decide it and say, 'Can I do this?' I mean, in the take -- I don't know if we rehearsed it or not, but it just happened. I was standing up and they weren't ready for it. They said, 'No, do that again.' And we did it for a second take, and like I said, it was just spontaneous.